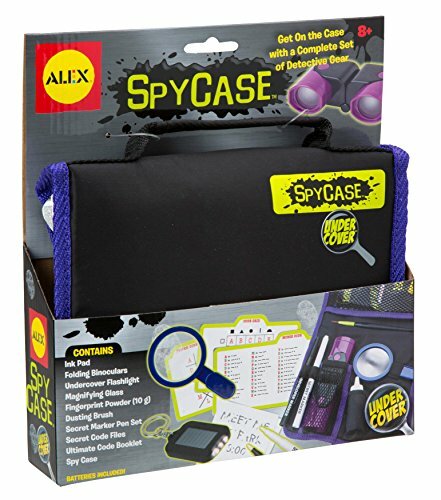 ALEX Toys Spy Case has everything for the super sleuth on the go. A sleek black nylon case contains binoculars, magnifying glass, fingerprint powder, brush, flashlight, secret marker pen set and a printed spy guide. The case can be carried by the convenient handle or looped through the belt, making it easy to transport at a moment’s notice. The set is also winner of the Dr. Toy’s Best Vacation Toys Award, so go get your spy game on. Includes case, ink pad, binoculars, flashlight, magnifying glass, fingerprint powder and brush, marker pen set, code files with booklet and batteries. Recommended for children 8 years of age and older. Grab this briefcase full of investigator's tools and get ready to track down some crooks! Learn about how detectives use forensic science to answer questions, gather evidence, and solve crimes. Experiment with the equipment and techniques used by real detectives to develop your own observation and problem-solving skills. First, you will set up your detective's office and organize your tools. Then, you will do some exercises to hone your observation skills. Next, you will learn about securing a crime scene, and gathering and documenting evidence, including fingerprints, footprints, and tire tracks. After you have gathered evidence, such as hair and fibers, counterfeit currency, and soil samples, you will head back to the lab to learn about analyzing it. Finally, you can try your hand at deciphering codes, writing messages with invisible ink, and communicating with secret symbols. As your detective skills develop, you can use them to solve the mock crime presented in the manual. The 32-page, full-color experiment book guides your investigations with rich illustrations and step-by-step instructions. This is an inventive, engaging way to learn real science through roleplaying in imaginary adventures. - A Parents' Choice Gold Award Winner. 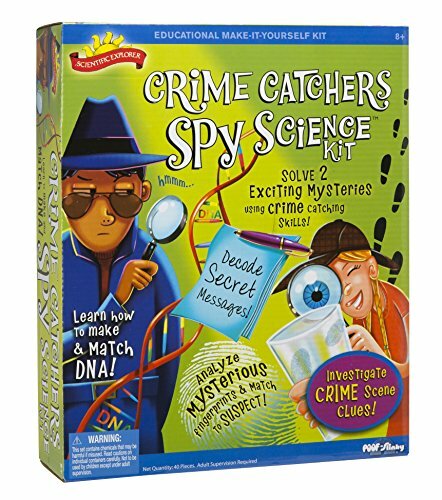 Scientific Explorer Crime Catchers Spy Science Kit is a safe and fun educational science kit that will have you following clues and gathering evidence by matching fingerprints, testing powders and liquids and decoding secret messages like a crime scene investigator. 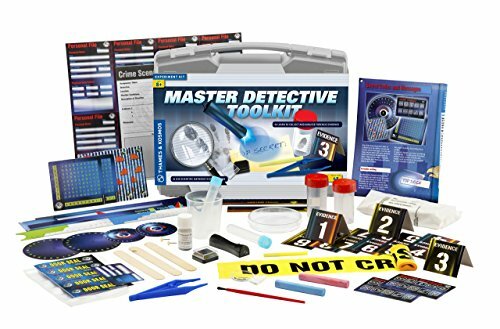 Follow the instruction booklet to solve the 2 exciting mysteries with 8 different activities and learn some really cool science about how real crime labs work. Compare evidence, ask questions and make observations using different senses. Let's solve some mysteries! Includes 2-baking soda (0.25oz. ), citric acid (0.25oz. ), 2-flour (0.25oz. ), 12 suspect cards, 6 ph strips, 3 coffee strip filters, 3 cups, 2 markers, 2 plastic bags, decoder glasses, graduated cylinder with cap, painting, rubber band, shoe print, test tube with cap and activity guide. Recommended for children 8 years of age and older. 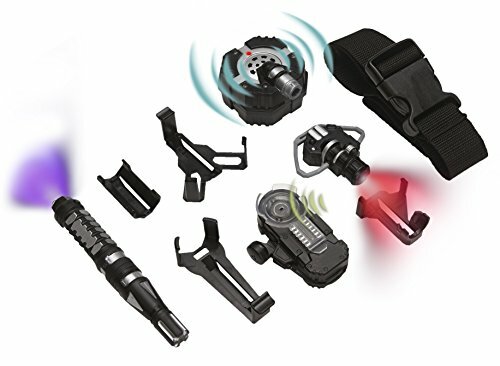 The SpyX Micro Gear Set includes all of your essential micro tools to play spy. Awarded 2015 Product of the year by Creative Child Magazine, this set is the ultimate value for anyone looking to play spy. Set Includes: Micro Ear Light (light to help you see in the dark) Invisible Ink Pen (write and decode secret messages) Micro Motion Alarm (detects motion or vibration!) Micro Listener (hear things from far away) Watch your junior agent play spy for hours at a time- this set of spy tools comes with endless possibilities! SpyX provides junior agents with all of the gadgets needed to spy like a pro. Playing spy is a fun way for kids to use their imagination while learning valuable skills through role play. Fun toy for ages 6+. Collect all SpyX toys for the ultimate spy play experience. 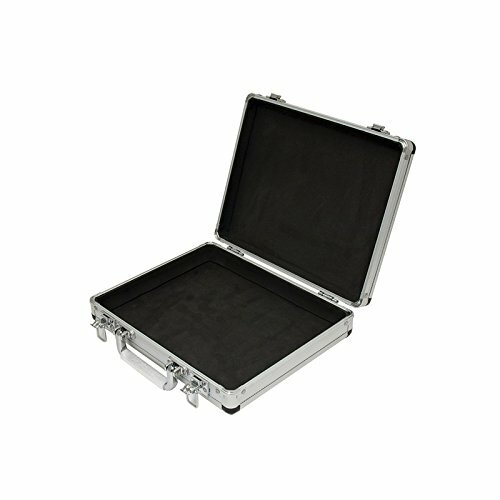 A thin aluminum flight case ideal for storing small tools, paperwork, and even small tablets and netbooks such as the kindle when purchased with the foam (sold separately). 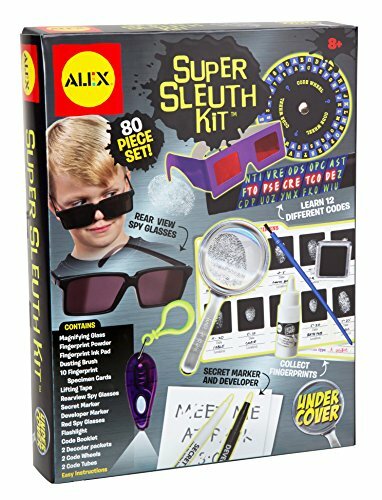 ALEX Toys Super Sleuth Kit is the perfect gift for the detective in every kid and ideal for curious youngsters. Watch as your kids build academic skills through observation, creative reasoning, and imaginative play. Amateur sleuths can use items such as rearview glasses, code wheels, and composite drawing materials in a variety of imaginary detective scenarios. A colorful Spy Guide provides easy-to-follow instructions for activities such as taking fingerprints, documenting "suspects'" moves, and deciphering coded messages. The kit includes magnifying glass, fingerprint powder, fingerprint ink pad, dusting brush, 10 fingerprint specimen cards, lifting tape, rearview spy glasses, secret marker, developer marker, spy glasses flashlight with 3 LR41 batteries, code book, 2 decoder packets, 2 code wheels, 2 code tubes and easy instructions. Recommended for children 8 years of age and older. You need your GPS Tracker to do its job under any condition, and if you want to keep your GL300 tracker looking and functioning like new, a quality case is essential. 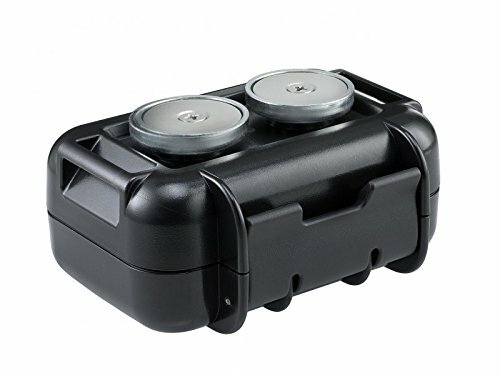 Not only does the GL300 case protect your tracker with a durable outer layer of PC and ABS plastics, but it significantly enhances the function of the tracker. By applying the magnetic case to any flat, metal surface, you can effectively mount your tracker anywhere in, on, or underneath your vehicle. The case also has a fully waterproofed exterior, protecting the tracker from exposure to rain, snow, or dirt while outside a vehicle. With the GL300 case, you can be assured that your tracker stays functional no matter the circumstance, whether you run over a pothole, drive off-road, or expose your tracker to the harshest elements. Features: Constructed of PC and ABS for durability Firm magnetic mount Compact size Suitable for use with GL-200. 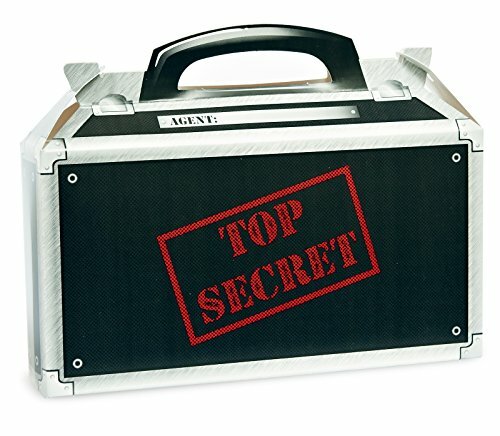 Looking for more Spy Case similar ideas? Try to explore these searches: Series Mesh Chair, Reserve America, and Seiko Strap Dress Watch. Look at latest related video about Spy Case. Shopwizion.com is the smartest way for online shopping: compare prices of leading online shops for best deals around the web. Don't miss TOP Spy Case deals, updated daily.